An F.B.I. Agent teams up with a tracker to pursue a murderer after he vanishes into the mountains and infiltrates a hiking group. Steve: [back on the phone] Stantin... did you get the message? The way that action movies should be made. 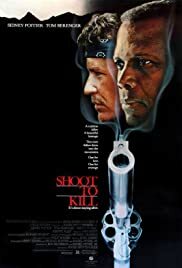 Shoot To Kill (GB title: Deadly Pursuit) is a lively, fairly intelligent action film which benefits from good character development. Many post-1980 action films suffer because they are empty spectacles, full of boring stock characters and visually impressive/emotionally redundant stunts. However, this one is different. There are eight main characters (all of them well-realized) as well as a fundamentally exciting plot, sharp dialogue, and a spectacular mountain setting. FBI agent Warren Stanton (Sidney Poitier) is desperate to track down a dangerous jewel thief following a botched hostage situation. He suspects that the thief has joined a five-man hiking party in the rugged wilderness near Spokane. Unfortunately, there is no way of contacting the hiking guide Sarah (Kirstie Alley) to warn her that a dangerous killer is among her group. Instead, Stanton has to put his trust in another mountain guide, rough and tough Jonathan Knox (Tom Berenger). The unlikely pair pursue the hiking group, hoping to reach them before the killer strikes again. The film moves at a good pace. Interest is generated on several different fronts: the volatile relationship between Stanton and Knox; the intriguing guessing-game as to which member of the hiking party is actually the jewel thief/killer; the "race-against-time" tension (as soon as the hikers have entered Canada, the killer could dispose of them at any time). There is spectacular action, but it is not emphasised to such an overwhelming degree that other story threads are lost. Shoot To Kill is a very commendable action film and it is a pity that more films in the genre are not up to the same standard.